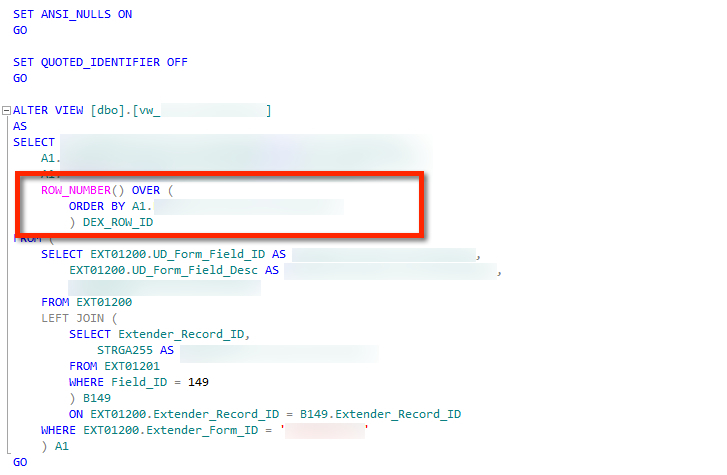 I have a requirement in which I have to access a SQL view from within my customisation dictionary, in order to create a custom lookup for users to select a value based on an Extender form and an Extender lookup. 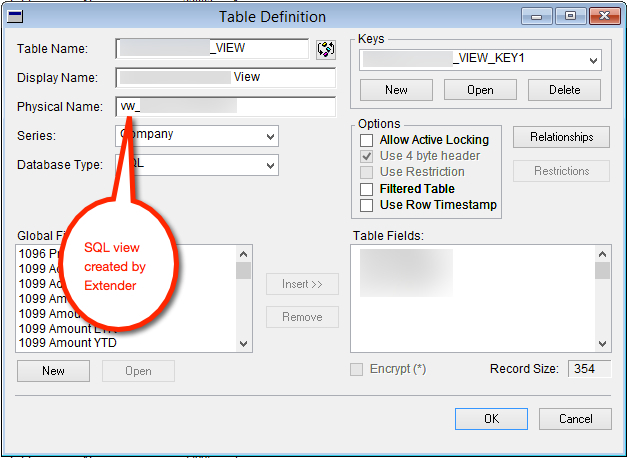 Easiest option is to create an Extender view (which in turn creates a SQL view for us). Now, this is the view that I am suppose to refer to from my custom dictionary. Dexterity allows us to refer to any SQL object by simply create a TABLE definition and mention the SQL object (table or view) name as the physical name. Error message is quite obvious; you do not have DEX_ROW_ID in that SQL view that you are referring to. Every single Dexterity table must have DEX_ROW_ID at the backend. It cannot afford to not have one. Definition of ROW_NUMBER() can be found here: ROW_NUMBER (Transact-SQL). A simple yet powerful SQL function has given me the power to do what I wanted in no time. Oh, and my custom lookup referring to this view is working like a charm. Users are happy and so am I. Almost a month back, I had posted my GP web client test drive results on how the client is rendered on Mac based browsers and possible issue with Silverlight plugin. I am probably wrong. Everything works other than pictures; that’s what I had found. Upon drilling down further, what I realised is that it sounds obvious that it doesn’t work on Mac based browsers. Reason: Native Pictures. Apparently, by nature, it’s NOT supposed to show up on any OS other than Windows. It’s not just this picture. Lookup Button icons, Note icons are all Native Picture types. And due to that, they are not going to render on any other OS. And if I am not mistaken, this will remain as it is at least till next major version of GP. 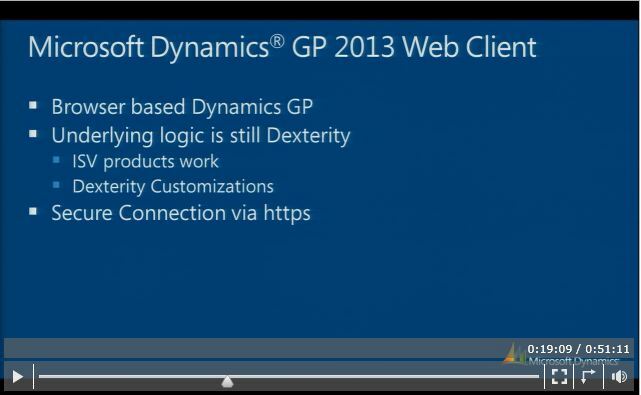 Those who implement GP web client MUST be aware of this. UPDATE: Author of this book, Leslie Vail, has got a post on her blog (Dynamics Confessor Blogspot). Link now added here to her own post: Published at last! 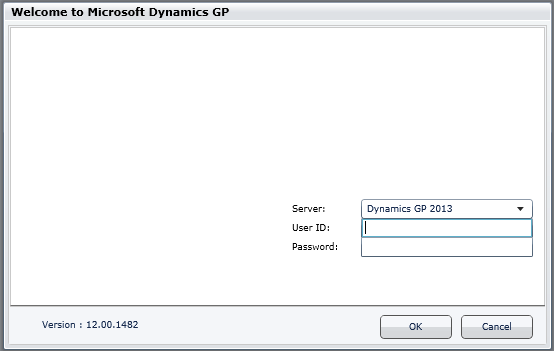 Developing Microsoft Dynamics GP Business Applications. I had the privilege to be a part of the technical reviewing of this amazingly informative book: Developing Microsoft Dynamics GP Business Applications. This book is penned by one of the most experienced GP personality and multiple times MVP, Leslie Vail. Packt Publishing has published this book. I strongly recommend this book to all GP developers/consultants who would like to know how to develop anything with regards to Dynamics GP; be it a new feature addition, a feature modification or just a cosmetic enhancement. Thanks Leslie Vail for this wonderfully written book with every single important concept being covered. This post is kind of reblogging David’s post, Cross Dictionary Dexterity Development, for just one reason. We can write cross dictionary triggers on DEX.DIC. I had tried this once, some years ago, and could not succeed. I never got a chance or requirement again that would push me beyond that limit. Looks like that chance is here and now. And this is certainly the right time for me to reblog this point and the post itself. Well, this one is surely a delight for me personally, because I am a die hard Dexterity Developer and I always had and will recommend any customization to be on Dexterity. I took this snapshot as is from the virtual session. Recently I converted all our existing VBA customizations (critical ones) to Dexterity and now this news. Those who were preaching against Dexterity and predicted it’s doomsday, please change your mindset at least from now. This one is certainly a nasty issue, if we are going to use DEX_ROW_ID value on customization or integration. I have personally fallen into a trap by using DEX_ROW_ID on my customization. But now, it’s all wisdom out of that bad experience. Only time when I normally depend on a DEX_ROW_ID is to sort records to understand which record was entered last in the table. That itself may not be always correct. So we may have to add other logical fields that are relevant to a particular record. For instance, if I have to list out transactions entered on a particular day and check in the order in which the records are created, I would use the Transaction Date and DEX_ROW_ID as SORT ORDER. There are many other reasons, but restrict yourself to use DEX_ROW_ID only for selecting records and analyze it. Back from my vacation, several posts grabbed my interest as a developer. This post from David is one of them. 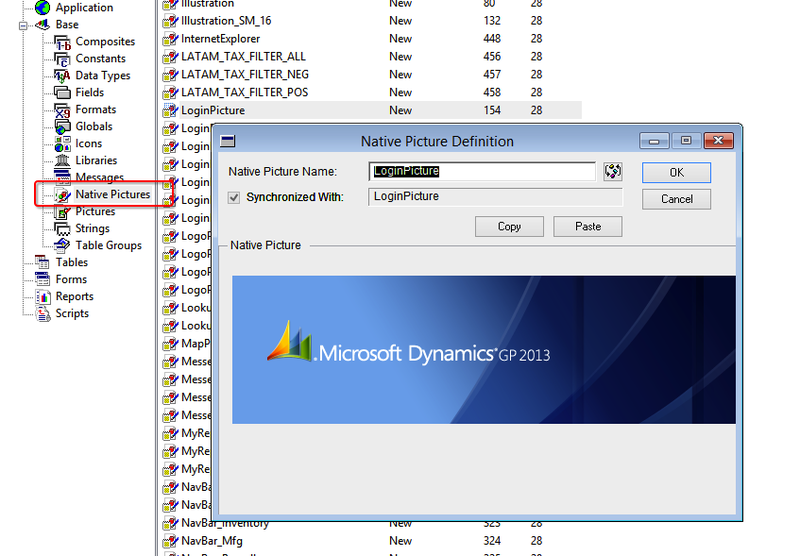 David explains how to resolve an issue that was found in Sivakumar’s SDT (Support Debugging Tool) based solution. In a nutshell, the issue was with Text type fields and dexterity function substring(). Read it here; Quick Tip: Using substring() with a text field datatype.